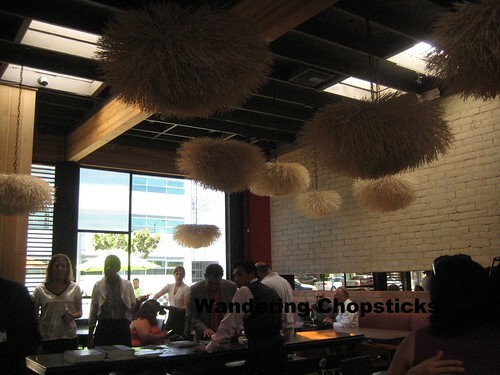 I was invited to a media preview luncheon at Playa Restaurant in Los Angeles for AltaMed's East LA Meets Napa 7th annual food and wine event. It's my favorite food and wine event, not only does it benefit underserved communities in Los Angeles and Orange Counties, but East LA Meets Napa brings together mostly Mexican, and other Latino restaurants, and wineries. 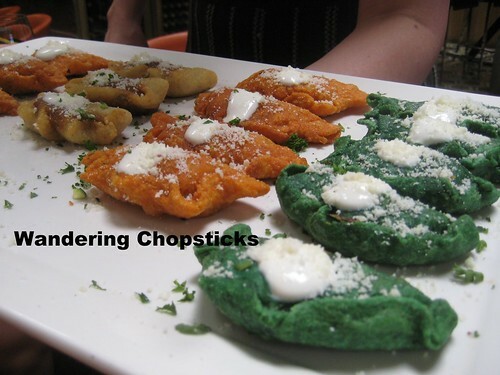 It's a great way to explore regional Mexican cuisine, and even sample pre-Hispanic dishes. 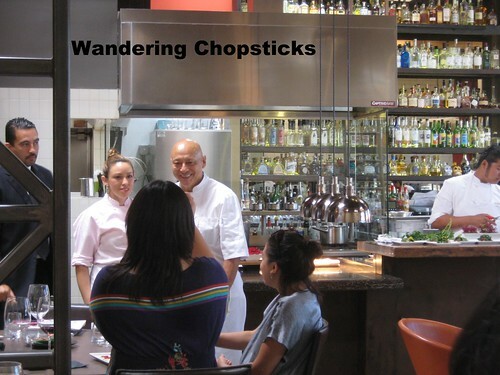 Check out my previous posts of the 4th, 5th, and 6th Annual East LA Meets Napa food and wine events. Playa Restaurant is owned by John Rivera Sedlar, of Top Chef Masters Season 3 fame who also owns Rivera Restaurant, known for its flower-pressed tortillas. While waiting for the others to arrive, I checked out how the flower tortillas were being made. 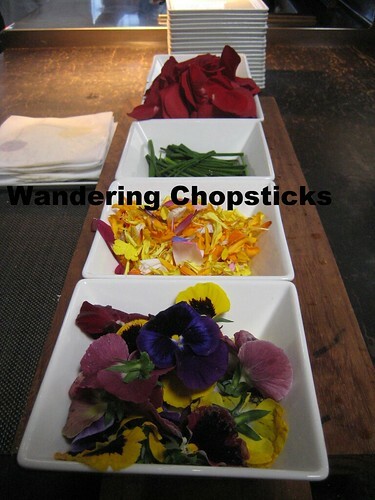 Rose petals, chives, marigolds, and pansies. All edible. They'll be pressed into the tortillas. You'll see at the end of the post. 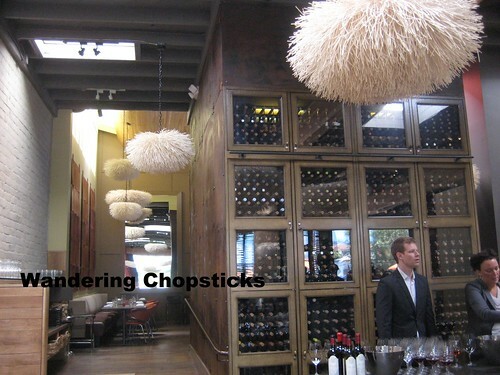 The pom pom fixtures reminded me of sea urchins. Playa really does have a beachy feel. 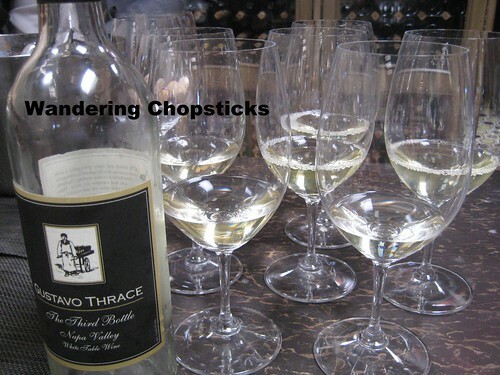 White table wine from Gustavo Thrace Winery in Napa. 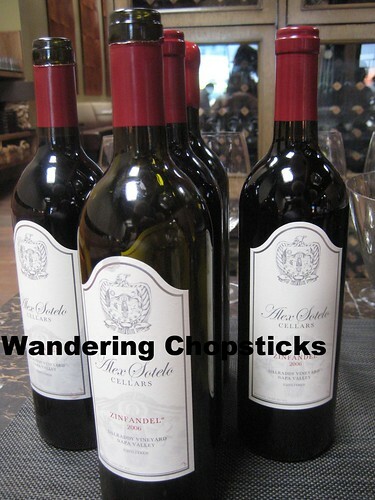 Zinfandel from Alex Sotelo Cellars in Napa. Vanessa Robledo from Black Coyote Wines said she's the fourth generation of her family to make wine. 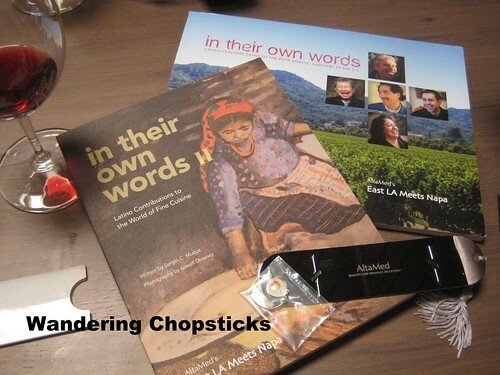 This year was also the release of the second "In Their Own Words" by Sergio C. Munoz, who wrote profiles of the owners of many of the Latino restaurants in Southern California. The first volume was profiles of the owners of the wineries. In both books, I was struck by how many of the businesses were started as struggles to survive, to feed their families while still holding true to their heritage. The books are a great peek into the lives of the people who started some of the most well-known restaurants in SoCal. 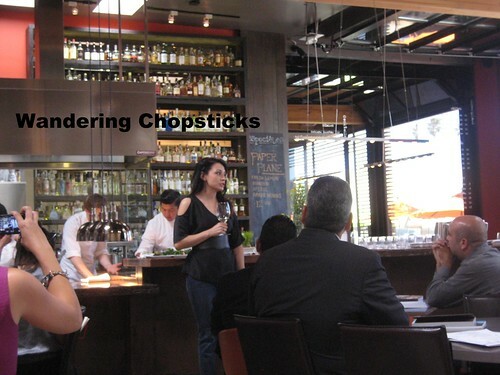 We started off with appetizers from Chef Rocio Camacho of Rocio's Mole de los Dioses in Tarzana and Sun Valley, who specializes in pre-Hispanic Mexican cuisine. Basically, think of Mexican food before the Spanish conquistadors arrived. Crickets! 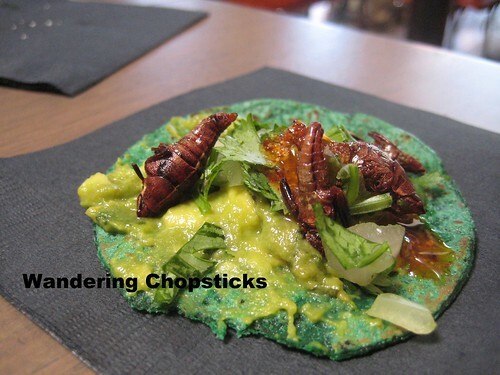 I tried crickets for the first time at Guelaguetza Restaurante - Los Angeles, which specializes in Oaxacan cuisine, and found them crunchy and not much else. Doesn't it look like they're diving head-first into the guacamole? I would too! They added a nice crunchy foil to the creaminess of the avocado. Empanadas tres soles with huitlacoche (Mexican corn fungus), squash blossom, and a third flavor that I can't remember. 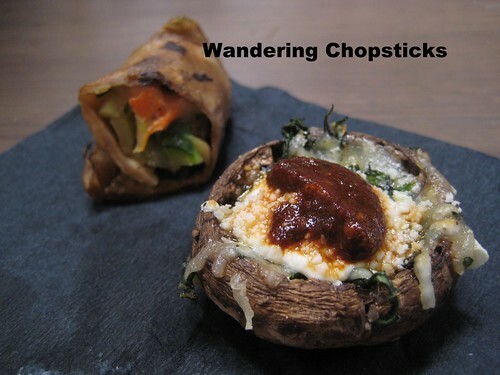 Hongo relleno de fina hierbas y queso (Mexican stuffed mushrooms with fine herbs and cheese). 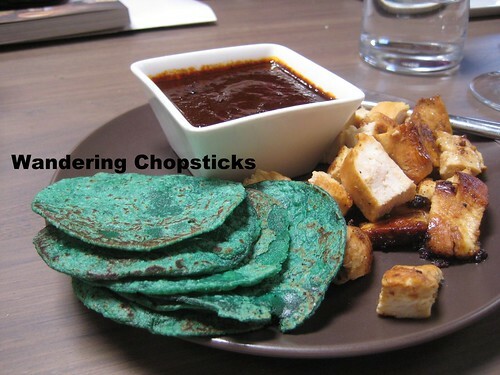 Grilled chicken, mole, and tortillas. 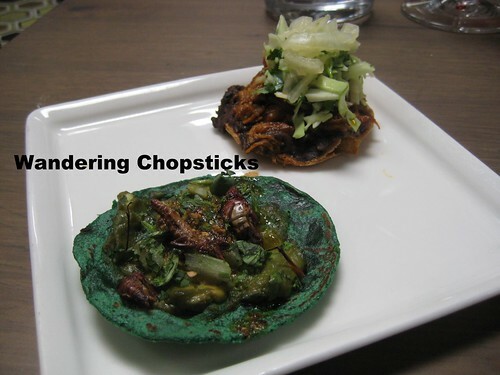 More fried crickets and a tostada in the back with pork, refried beans, and marinated onions by Chef Hugo Molina of Seta dine:lounge in Whittier. His short ribs and polenta that I sampled at previous East LA Meets Napa events are amazing. 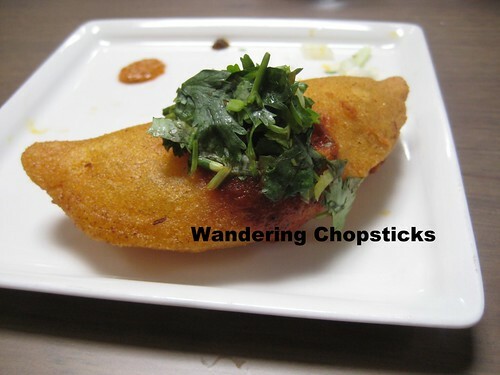 Empanadas with beef and Manchego cheese. 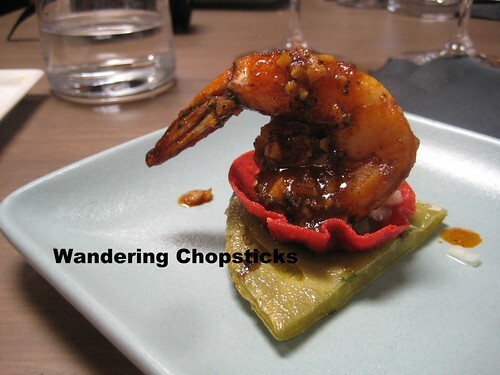 Shrimp in sweet garlic with red bell pepper on a fried cactus. His famous flower tortilla. Everything on the tortilla was grown on his rooftop garden. Rooftop garden! Of this restaurant! 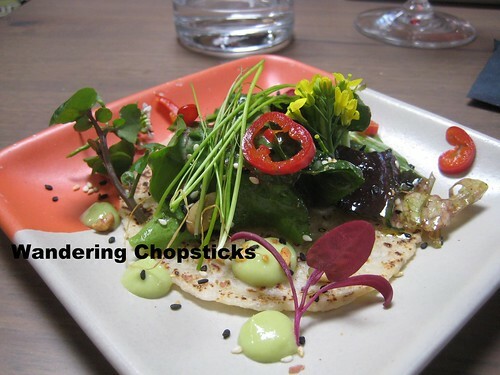 Here, I've moved the greens aside so you can see the flowers pressed into the tortilla. But that rooftop garden! I couldn't get that out of my head. As the event started wrapping up, Chef Sedlar took small groups of people on the roof of Playa Restaurant to check out his garden, but that deserves its own post. I highly recommend AltaMed's Annual East LA Meets Napa event and look forward to it every year. Great food and drinks all for a good cause. Proceeds benefit AltaMed's medical care, dental clinics, senior services, health education, youth, HIV/AIDS care, and substance abuse prevention programs. Thanks to Sandy Nesheiwat for inviting me! I had a fabulous time. Tickets to AltaMed's 8th East LA Meets Napa food and wine event on Friday, July 19th can be purchased via Brown Paper Tickets. Monday to Thursday 4:30 p.m. to 9 p.m.
Monday to Thursday 11 a.m. to 3 p.m. and 5 p.m. to 9 p.m.
Tuesday to Friday 11 a.m. to 2:30 p.m.
Tuesday to Wed 5 p.m. to 9 p.m.
2 years ago today, Bun Ca Ngu (Vietnamese Tuna Rice Vermicelli Noodle Soup). 3 years ago today, Tabor (Food Cart) - Portland - Oregon. 4 years ago today, lil' sis's 21st birthday bash. 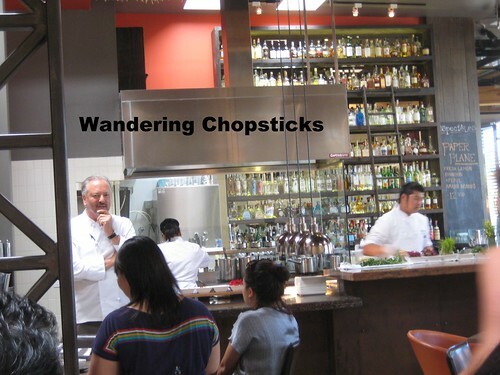 5 years ago today, revisiting Mission 261 - San Gabriel and Pinkberry - Rancho Cucamonga. You are certainly braver than I am. I don't think I can do crickets -- crunch or no. 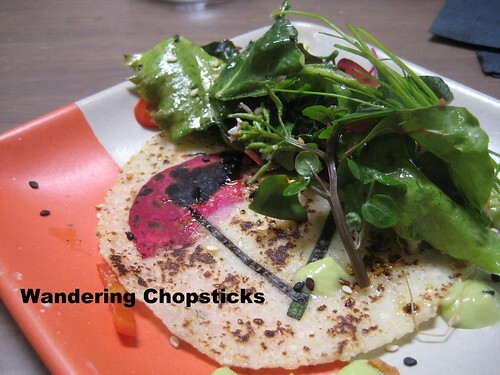 What a fun idea to press flowers into a tortilla :-) Looking forward to seeing that rooftop garden. Crickets aren't so bad. I've eaten waxworms and silkworms too. 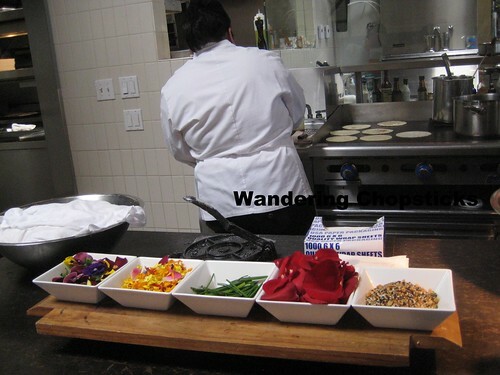 :P The flower tortillas are pretty, but not much flavor. 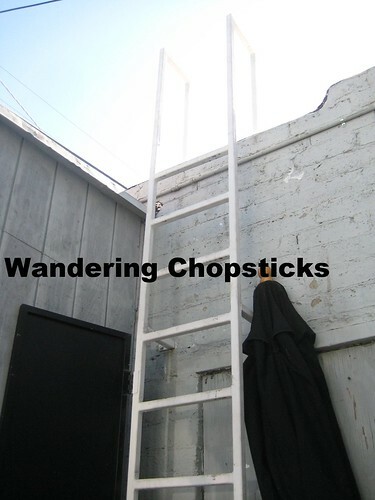 I already blogged the rooftop garden, it's linked at the mention and is the post after this one. Does it not show up on the reader?